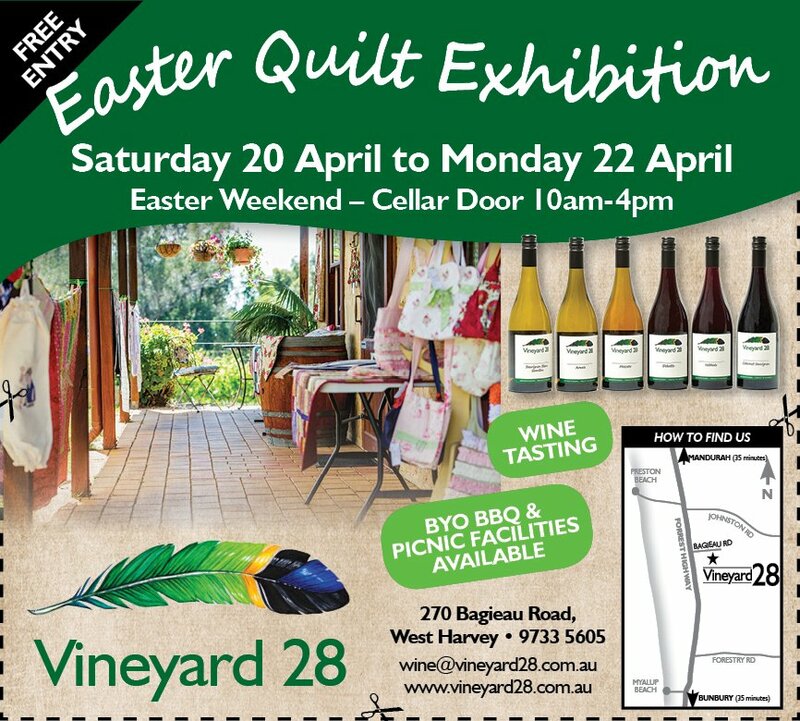 There will be lots happening over the Easter Weekend here at the Vineyard 28 with our annual Quilt Exhibition on at the Cellar Door. Come along to catch up on all the latest works by owner, Pippa Nielsen, who has been making quilts for just on 20 years. There will also be new quilts on display and for sale from many other local Quilt Artisans from Harvey, Australind and surrounds. We’ll also have a Christmas table full of crafts just so you can plan ahead this year. We are also looking forward to featuring hand painted miniatures by local Myalup Artist Graeme McPherson. The Myalup Easter Fair will take place on Easter Sunday, April 21, 2019 from 10-3pm. It will be a day of Good Old Fashioned Family Fun & community fundraiser for the Myalup area. Visitors can shop at the fabulous quality market stalls, have a listen to the bluegrass band, try their luck in side show alley, eat delicious food from local food trucks & enter their pets into the Pet Parade!! Be sure not to miss the amazing art display including the Youth Art Exhibition & Competition. Local artists will be contributing & judging on the day. Vineyard 28 will be their offering wine tastings and sales we would LOVE to have you come along and be a part of the fun!! SEE YOU ON EASTER SUNDAY!! More info is available at the Myalup Easter Fair Facebook Page.